There’s no greater joy than seeing your baby smile and laugh, whether it’s at you or with you! 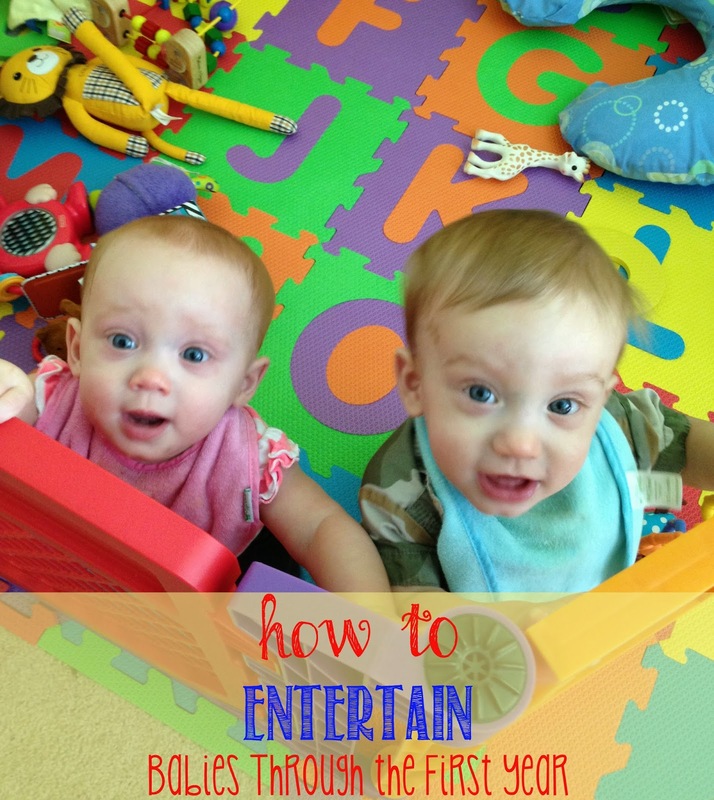 Playtime for babies is not only fun for you both, but it’s how they develop and learn. Your baby staring at your face may not seem like a learning opportunity, but it can be. With purposeful play, you can encourage early learning through ordinary activities. Purposeful play is focused play. It’s spending one-on-one, or in our cases, one-on-two time, with our children and teaching them instead of just letting them play. It’s as simple as describing your facial features to them during one their endless gazes at your nose and mouth, or playing peek-a-boo, patty cake and hide-and-seek. It’s been said so many times that babies are sponges, so what better way to foster their education than to make every day games and activities more meaningful. Newborn to three months: Break the silence! Talk to them, sing to them, and carry on conversations with yourself. You will feel very odd, but they will be entranced with your voice, and they won’t judge you on your singing capabilities! It’s so easy to get into a quiet routine and forget that babies are watching every move we make. Talking to them and describing your actions helps stimulate them, and encourages speech and communication. You could also break the silence by barking like a dog, mooing like a cow or making some other animal noise. It will surely grab their attention and cause you to have a good laugh at yourself! Great toys for this age include: toy mirrors, small hand toys like rattles, play mats such as an Infantino Twist and Fold Activity Gym, and mobiles such as the Fisher Price Discover n’ Grow Twinkling Lights Mobile. Three to six months: This is a great age to introduce tickles fights and games like ‘I’m going to get you.’ They’re becoming more responsive to your silly animal sounds and horrible dance moves, so keep moving and talking, and encourage them to imitate you. Play peek-a-boo, patty cake and ‘this little piggy.’ Tummy time is most likely their favorite activity at this age, so you could lay down with them and read to them or encourage them to move around by placing objects just out of reach. Great toys for this age include: colorful teething rings, such as the Infantino Ring-A-Links Teether Set, board books and squeaky toys. 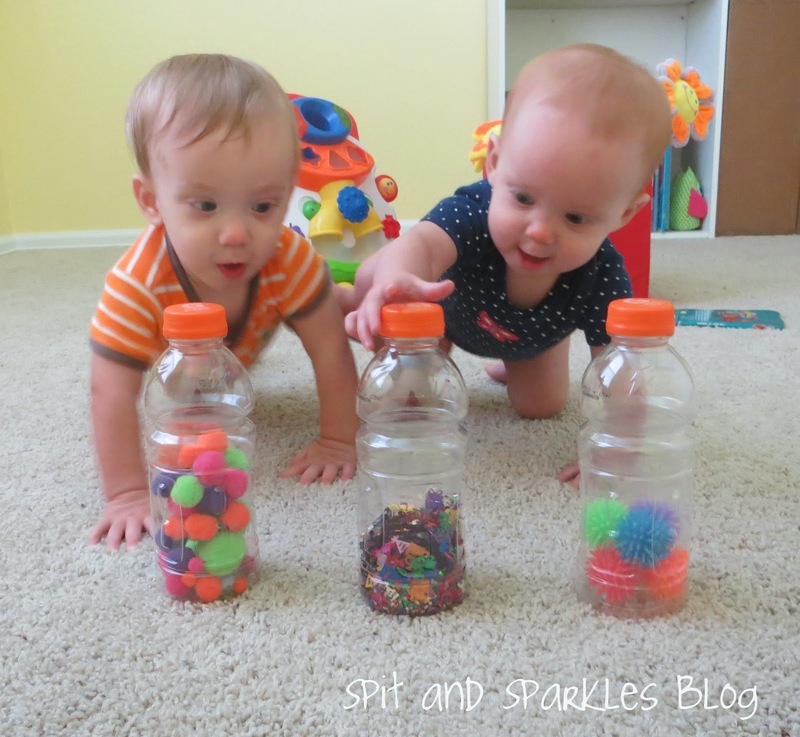 Six to nine months: Sensory play with discovery bottles is a great make-at-home activity that will provide hours (ok, minutes) of fun! Grab a few empty drink bottles and fill them with small balls, confetti/sequins, buttons, colored rice, water/glitter or anything else you can think of. Put them and your twins down in the middle of the room with no other toys around for distractions, and let them “discover.” They’ll learn cause and effect, colors, sounds and shapes. Great toys for this age include: Sensory balls like these from Nubby, board books, stuffed animals, and your wooden spoons and measuring cups! Nine to 12 months: Introduce hide-and-seek to your baby. This can be played by you hiding and baby finding you or you can hide baby and find baby. Hiding underneath stuffed animals and asking your baby to come find you, will surely get his/her attention. When baby gets close, pop out, tickle her, and cue the laughter! You can also go a step farther and hide objects. For example, let baby watch you hide a ball or bigger toy under a blanket. Ask her to find the toy. To begin, leave a bit of the toy poking out. As baby gets the hang of it, you can decrease the size of the objects you are hiding and completely cover them. Hide-and-seek teaches object permanence, cause and effect, problem-solving, and strengthens memory skills. Great toys for this age include: push toys such as the Fisher Price Brilliant Basics Musical Walker, shape sorters, colorful stacking cups like these from Babies R Us, and toy telephones. 12 months: Once your baby is a year old, they’ll probably already be saying a few words. This is a great time to focus on early language learning and object recognition. Gather up several toys (balls are easiest to start with) that are the same but different colors and sizes. Next, place your baby in the middle of the balls and tell him/her what the name of the toy is. Let baby look and pick up all of the balls, and ask her what they are. Say the name of the toy over and over, and ask baby to repeat you. Encourage her to hide and find the ball. You could also take this opportunity to practice numbers and counting. 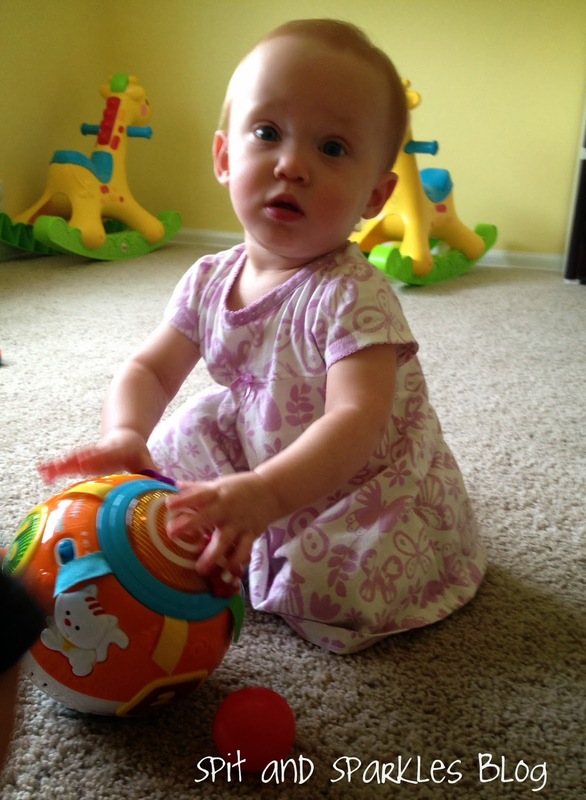 Once baby has gotten the idea of what a ball is, show her two toys. Hold the ball in one hand and another small, similar toy, such as a block, in the other hand. Ask baby which one is the ball. These activities encourage listening and communication, object recognition, memory skills and thinking. Great toys for this age include: Ride a long toys, such as the V-Tech Alphabet Train, rocking horses or giraffes, like this one from Fisher Price, and building blocks. This article was originally written for Twiniversity.com, the premier website for parents of twins and multiples. This is super helpful! Nate and I are starting to try for our first kiddo and I love reading about how other moms handle things like baby play time. I’m so happy this post is useful to you! Good luck trying to conceive It’s such an exciting time! I’m a twin momma too! Mine are identical boys who are 4 now. I take my hat off to you! I was in “survival mode” for a good 6 months after they were born. We were all lucky to get bathed everyday. I do have to say, they get easier with age. Hey Elisha! Thanks for the sweet compliment! I have to admit that I was also in survival mode for many months. I did try very hard to incorporate playtime during the first months, but it wasn’t until mine started sleeping through the night at six months old that I had the energy to go farther with learning activities! And on most days, we just play with random things. I do my lessons about once or twice a week right now. Thanks for stopping by! And I am glad to hear that it gets easier! This is great! I’m always looking for new ideas to entertain my 10 month old! I love love love your purposeful play ideas. I’m going to try the hide and go seek with Gray. I’m definitely sharing this post. Thanks so much (as always) for linking up with us at the homeschoollinkup. I learn so much from each of your posts. Thanks so much Lisa for your continued support! Love your linkup and your blog! This is super helpful! I love the discovery bottles:). I love these tips! Pinned! I think this would be the start of a fun and informative printable.